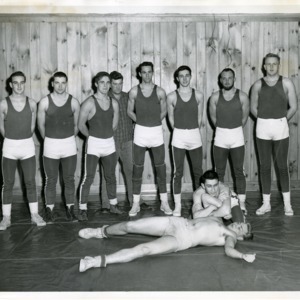 Photograph of the 1960 Wrestling team members. Standing: B. Rivard, R. Lind, A. Amidon, Coach K. Norton, Capt. B. Durham, J. Hunter, C. Hultman, N. Schweizer. Sitting. T. Ferrari. On Floor: H. Seymour. “Wrestling 10,” Paul Smith's College Historical Photographs, accessed April 22, 2019, http://archivesphotos.paulsmiths.edu/items/show/4584.